Tate Thriffiley, "I am not a Christian, and I do not believe in God." Tate Thriffiley going straight to hell: ‘I am not a Christian, and I don’t believe in God’. Mr. Thriffiley prepares to lay it on a mostly christian the crowd that he is an atheist. Mr. Tate Thriffiley prepares to shock Marie Hibbler and a mostly Christian crowd with the idea that he isn't a Christian and he doesn't believe in God. After Thriffiley initially had his chance at the podium, Marie Hibbler took to the podium for a sermon of a lifetime, practically condemning the audience to hell with her "Little Johnny" joke. Thriffiley insisted on taking the podium for a second time against the wishes of a tired and frustrated Hattiesburg City Council President Kim Bradley to drop a bomb. He's going 'straight to hell' according to Mrs. Hibbler and other experts in the matter. 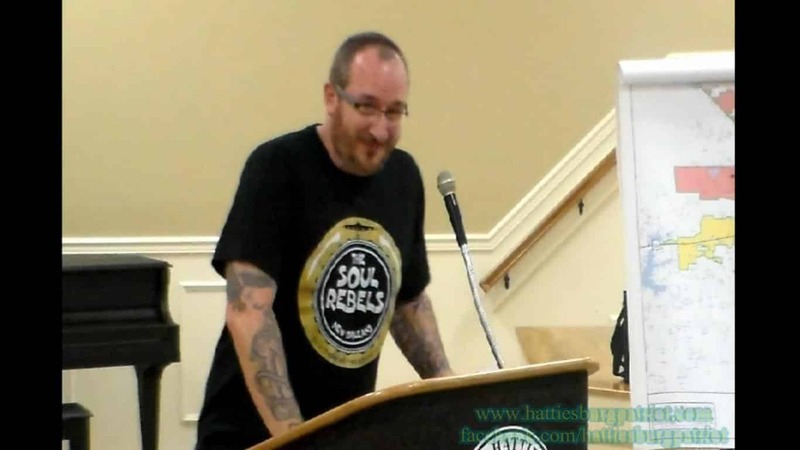 So, wearing a "Soul Rebels" Shirt and in smooth Tate Thriffiley fashion, musician Tate Thriffiley laid some heavy jingles on a mostly Christian crowd. Marie Hibbler's video is below. If you want the full context watch Marie Hibbler's entire video prior to Mr. Thriffiley. the great part about the old (and mostly dead) spirit of America is that Mr. Shiffley has every right to go to hell if he chooses.. or the Dairy Queen.. or a movie.. or for a walk… or whatever! Why should I care as long as he doesn’t violate my right to life, liberty and property! the great part about the old (and mostly dead) spirit of America is that Mr. Shiffley has every right to go to hell if he chooses.. or the Dairy Queen.. or a movie.. or for a walk… or whatever! Why should I care as long as he doesn't violate my right to life, liberty and property!